The president of HPL Inc. wants to know the effect of different inventory costing methods on the financial statements. For the purpose of comparison of some popular inventory costing methods, the following data was selected. Cash balance on January 1, 2013: $14,000. Retained earnings January 1, 2013: $20,000. Inventory on January 1, 2013: 8,000 units @ $6. The HPL Inc. sold 10,000 units for $240,000 during the year 2013. The total purchases were 12,000 units @ $8 each and the total operating expenses were $25,000 during this period. A periodic costing method is used. 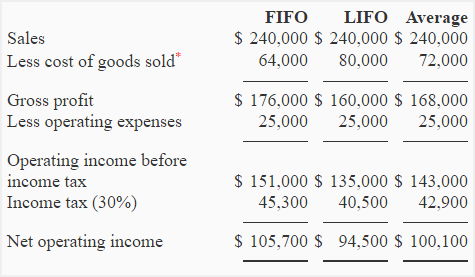 Prepare a comparative income statement using FIFO, LIFO and average costing method to show the effect of each on net operating income of HPL Inc.
FIRS I WOULD LIKE TO THANKS FOR YOUR CLEAR AND UNDERSTOD PREPARETIONS.ITS USEFULL AS INFORMATION FOR REMEMBER THE SYSTEM IN MY WORK. took place during April 2017. 1.1 Determine the value of closing inventory based on the First-in-first-out (FIFO) method. of rice is R5. The cost of placing an order for stock is estimated at R160. The information provided below relates to Prague Enterprises. 1. The bank balance on 31 May 2018 was R9 000 unfavourable. Cash sales are estimated at 10% of total sales. – 30% in the following month. during the month of sale. 6. Insurance amounts to R72 000 per annum payable monthly. costs and an increase in variable overhead costs of R15 per unit.